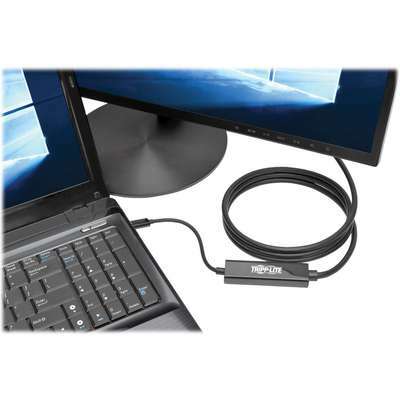 USB 3.1, generation 1 USB-C to HDMI 4K adapter cable (M/M) helps you transmit digital audio and 4K video from your tablet, laptop, Chromebook, MacBook, smartphone or PC to an HDMI-enabled TV, monitor or projector. Plug-and-play technology makes installation quick and simple - with no software or drivers to install. Fumble-free, reversible USB-C plug connects in either direction for a quick connection every time. Foil and braid shielding protects against EMI/RFI line noise that can distort or destroy data. Integral strain relief helps cable and connectors move freely without stress or cracking for lasting use. 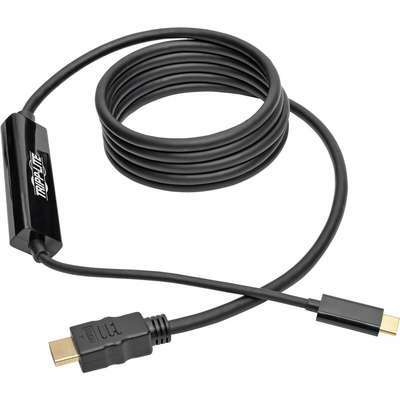 6' cable supports UHD video resolutions up to 3840 x 2160 (4K x 2K) at 30 Hz, 36-bit Deep Color and per-lane transfer rates of 5.4 Gbps, 2.7 Gbps and 1.62 Gbps. Cable is perfect for giving video presentations in conference rooms and classrooms, editing multiple documents on a larger screen, or streaming video for digital signage in crystal-clear 4K. Microsoft Surface Book 2 i7 16GB 512GB SSD GPU 13.5"
Microsoft Surface Book 2 i7 16GB 512GB SSD GPU 15"
Microsoft Surface Book 2 i7 16GB 256GB SSD GPU 15"
Microsoft Surface Book 2 i5 8GB 256GB SSD 13.5"